Strong partnerships continue to emerge at the Cape Town Central City Improvement District (CCID), as the organisation’s Social Development partner NGO TB HIV Care has been providing training on the safe handling and disposal of items known as “sharps” to the CCID’s Urban Management operational team. On its website, TB HIV Care states that to achieve their vision of being a leader in empowering communities to be healthy and free of TB and HIV, their activities aim to prevent, find and treat TB and HIV. In March this year, TB HIV Care’s Step Up Project teamed up with the CCID’s Social Management department to reduce the harms associated with substance use among people who live on the street. The Step Up Project provides people who inject drugs (PWID) with harm reduction, HIV prevention and wellness services, based on the World Health Organisation’s recommendations. This includes the provision of sterile injecting equipment and the safe collection and disposal of used equipment, as well as the offering of HIV testing and other medical services, including opioid substitution therapy (OST). OST provides people who are dependent on opioid-type drugs with medication that replaces the drug as part of a structured treatment programme. This, in turn, allows the individual to work on improving their life circumstances with assistance from TB HIV Care. 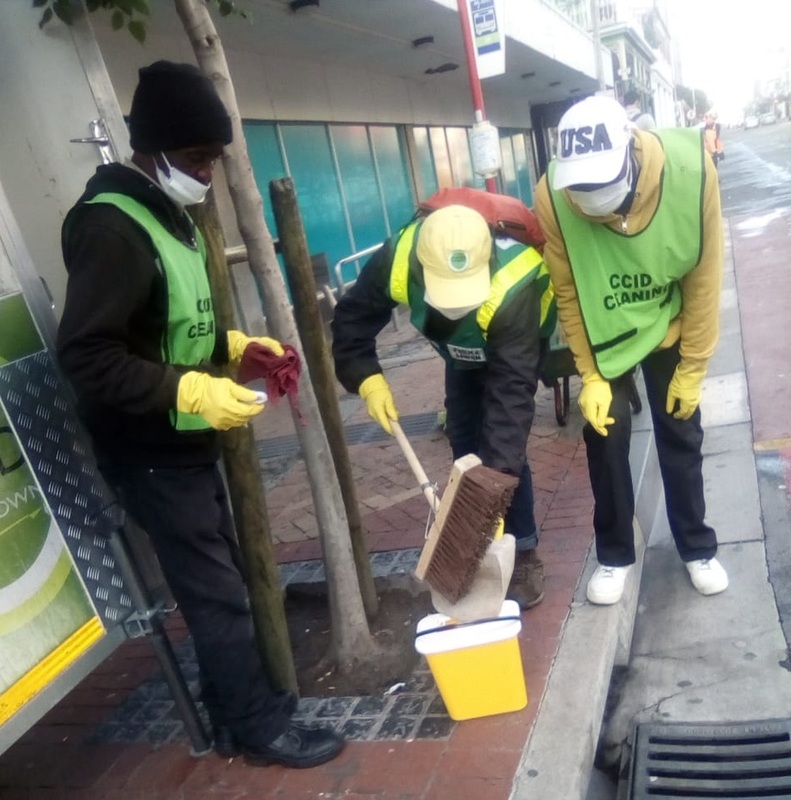 While a part of the pilot project also involves participants in an initiative that enables the careful clean up and removal of needles from public spaces, the collaboration with the CCID’s Social Development department has crossed over to the Urban Management department, as it was decided that it would also be extremely valuable for the teams who clean the CBD daily to understand the correct procedure for handling and disposing sharp objects (also known as “sharps” and referring largely to needles) while carrying out their day-to-day cleaning duties. Since June, 11 operations supervisors (five men and six women) from the CCID’s Urban Management team, contracted via NGO partner Straatwerk, have undertaken the training by TB HIV Care. While disposal regulations may vary across the world, it is not unusual to have programmes in place that also ensure the safe handling and disposal of sharps in cities. This because, if these aren’t handled and disposed safely, they can cause injuries to both members of the public and even animals, and can also spread infections that could result in other serious health conditions. Kally adds that as part of the agreement, Urban Management will be submitting quarterly reports to TB HIV Care regarding the progress of the initiative and also to ensure that Urban Management teams undergo refresher courses in a year’s time.